When it comes to the great global transition to a better world some places are completely fascinating to observe. For example, Bhutan and its policies of Gross National Happiness or Germany and their spread of community renewables. Brazil’s story of community banks and currencies is also absolutely fascinating. This article is linked to another article titled The new economy in Brazil: Through the eyes of a REconomist. When I heard a rumour that there were as many as 300 community currencies functioning, or being set up in Brazil, I just had to know more. I have family in Brazil and so while visiting I did some research and interviewed Rafael Misquita of Banco Comunitário União Sampaio (BCUS). Banco Comunitário União Sampaio translates directly to Community Bank Union Sampaio and Sampaio is short for Jardim Sampaio being one of the suburbs of Sao Paulo with high levels of poverty and depravation. 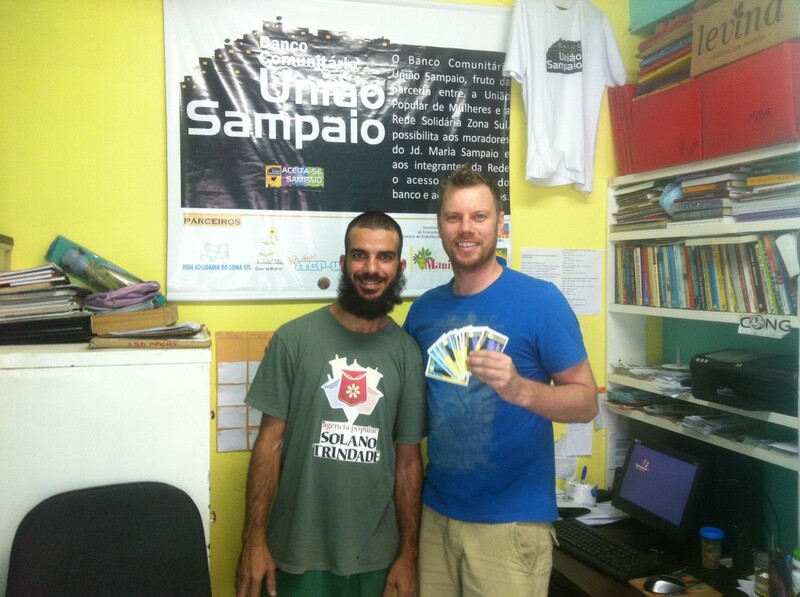 In the interview Rafael beautifully describes, not just the details of the currency and bank that he is working for, but the many facets of the wider community banking movement in Brazil. Firstly I’d like to summarise some of my personal reflections on the interview and research from a Transition and REconomy perspective. By the end of the interview what inspired me the most was not the sheer quantity and the rapid growth of the community currency movement, which is inspiring all the same, but its the incredible depth of this movement that leaves the most impact. That depth plays out in several ways like its historical roots or in the way in which these initiatives are very distant from any conventional notion of banks and money. They are about people and community and are unrecognisable in the traditional sense. The currency projects that i know of in UK are great but are still very recognisable in the traditional framing of money as they predominantly incentivise localisation at the point of consumption and trading. They come in from a point of trying to convince people that local money is a valid currency. For BCUS consumption and transactions are also important but, actually, their key area of operation is from a very different starting point. For example, their community bank is based in a kind of training centre. Their real focus is the people of their community and finding ways to use banks, money and credit structures to support their development but along side a web of training and networking and relationship building activities. Building literacy in the community, building the skills of the community and person by person building the economic capacity of the community and its people. Hopefully the depth of BCUS comes through in the interview. There’s a lot of experience and learning that Brazil has to offer to currency projects around the world especially in this area of strengthening and developing community. This brings me to a second observation. If the new money and new exchange movement had 10 commandments, one of the key ones would be the idea that any currency that is tied to a national currency is in some way not good enough, because it is still dependent upon the old and destructive issuance of money as debt by private banks. That’s clearly a problem because of all the related problems and reasoning discussed here. I’m no expert in this emerging currency field but I can only go on the feeling that i have that the currency and bank projects in Brazil are rewriting the relationships people have with money and banks. They are reinventing the ways in which people related to each other, support each other and collaborate economically on the ground and within communities. I think this is a benefit, that when delivered well, is incredibly important and shouldn’t be under estimated in its own right but I also get a sense that this is a route that enables that community to decouple itself physiologically from that total hypnotic sense of dependancy on traditional banks and money. Their trust in community issued money grows and they are realising that money is just a set of agreements and relationships and we can rewrite these at a community level. 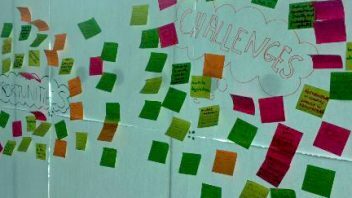 Another observation is that in many countries around the world we often see some connection between community currencies and Transition Towns. We see this in the UK, for example, with with Transition Towns helping to found the Brixton, Lewis, Totes and Bristol Pounds. That same connection doesn’t appear to exist in Brazil. There could be many reasons for that. If i was to hazard a guess i would say that these two movements aren’t connected yet because they operate in different financial bands. Transition is largely operating in a more affluent circle than the currency movement. But it would be, I think, of HUGE VALUE if the many Brazilian Transition Initiatives could connect with the many social currency initiatives. A final thing that stood out for me when researching the currencies in Brazil is just how difficult it is to find an up to date source of information online that comprehensively covers what is going on with new currencies and banks in Brazil. Most of the information was outdated. One of the best sources is the Banco Palmas website or this Portuguese pdf titled “Moedas comunitárias Brasileiras”, which identifies 108 currencies but the document was written in February of 2010, more than 3 years ago. Click on the image below to see the pdf. There was a clear need for a strengthening of the online presence of the national network of community banks so that Brazilians and the rest of the world could learn about what’s happening and be inspired. Rafael also talks about this below. 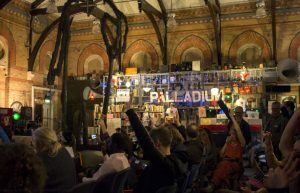 Notably, while i’m writing this article there has just been the third national gathering of community currencies pictured below. Oh, and final comment comes back to the sheer size of this movement as another currency has just been launched…. The interview is recorded in two section and you can listen, in Portuguese, to the first section here (57 mins) and the second section here (7 mins). Rather than transcribe the full hour long interview word for word I’ve covered the key points in English below. RM: To introduce the project we first need to know a little of the history. Our bank is based in the building run by the União Popular de Mulheres (which translates directly to Popular Union of Women) and we also operate using their legal status. The União Popular de Mulheres started forming around the 70’s in the suburbs of Sao Paulo. The city was growing rapidly at that time and people from all over Brazil would come to work on the construction of the city and the workers would end up living in suburbs like Jardim Sampaio with no infrastructure like water, electricity, health care, transport etc. The men would go to the centre of the city to work, often for a week at a time, and the women started to organise themselves (often with connections to the local churches) to find ways to provide people with things like basic literacy. The literacy work was lead by the work of Paulo Freire at that time. As well as learning to read and write these “women’s unions” would also organise exchange clubs because there were no markets and so difficult to buy things like cloths and food. SH: Do these clubs still exist? RM: Yes they still exist but more as political entities. The exchange clubs exist in the 70’s because of necessity. For many there was no other option. This same necessities created other collective actions like building each others houses or communal drainage or collective buying. SH: That’s interesting these are all (what I’d call) positive community outcomes of not having money but can you talk about the negative side too, for example, were there people getting into debt and being exploited? RM: I think that the negative side came much more from the side of capital. The people would come to work on construction projects but their employers would not pay well or give the workers the minim of basic conditions that were needed to live. These community orientated alternatives appeared because of that kind of exploitation. ….And over the years the União Popular de Mulheres grew and evolved in many ways and today it has a legal status, which is often used as an umbrella entity for lots of other entities as is the case with Banco Comunitário União Sampaio. And these days we (UPM) have our own space with many different projects and entities rooted in it. We pay the rent for the building through a “Bizarre” (a second hand shop) or events like bingo night. Over a period of years the bearucracy of running the space meant that our activities became very internally focused within the building and about 4 years ago we did an evaluation and decided that we wanted to spread out back into the community again, back on to the streets and into the schools. We also noted that the current needs of the community have in some ways changed. For example many women now work and the people who have the greatest needs are often older people. So as part of our activities designed to take us back out into the community we got to know people from the Universidade de São Paulo (USP) that had an incubator program for cooperatives, which included a government approved program designed to spread community banks in Brazil using the technology and methodology of the Banco Palmas. Banco Palmas is the first community bank in Brazil more than 10 years ago and since 2005 they’ve been replicating their methodology, which we’ve now started using. SH: Are you the only ones in Sao Paulo? RM: No there are five but the other 4 are communities coming together to build their homes. SH: I don’t understand? How does the currency help them build their homes? 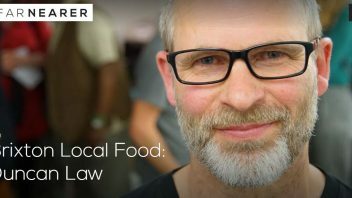 RM: No it doesn’t help them with this, the way the currency works is that it needs an organised community to function, and these communities organised themselves around housing needs and the community banks are then set up with the idea of developing the local economy. Often in these newly built suburbs they have very little in the way of a bakery or other commerce…. ….and so together with the local community we spent about a year developing the idea of our bank and currency. So we’ve matured and we now understand that the bank helps empower the people’s battle. For example we used to fight for water but now we have water. So the people’s battle evolves and so the idea of the community bank is one that generates lots of interest in people. They want to know what it is and from there we end up bringing people into a much bigger battle than just the operations of the bank. We want to build a whole new economy. We are questioning this economy. We don’t want to reproduce this economy and so we start the community on a process of reflection about the economy. SH: You’re promoting a different type of economy but does the necessity based around dire poverty still exist? RM: Yes we still have the extremest of poverty and misery but its not the community bank that will be the main agent that will address these issues. SH: You’re working with people that are already inside the economy? RM: Not necessarily inside the economy but they have to be people that can circulate the economy because they need to return money that we’ve lent to them. I’ll talk a little bit about the technology of the currency and you’ll understand better. In Brazil there are no laws that cover community banks. There is recognition of community currencies and the state pretends that it doesn’t see the other things that we do. In fact the state supports community banks. It supports us but its a type of lying support. As there is no law regulating this. The state can’t give us money to do our work. It can give infrastructure, equipment and help pay wages sometimes. But it can’t give us money to lend and to circulate in the community because the law doesn’t permit this. We need to get these resources in other ways, from private initiatives or through the community. 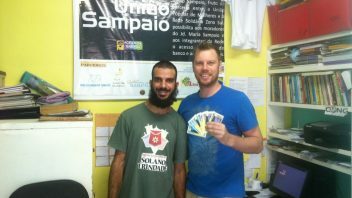 For example, our last R$20,000 capital that we use as credit to loan out was fundraised from a crowd funding website. SH: Do the crowd funders want there money back, is it a loan or a type of donation? RM: No, they receive something in return for their donation. RM: Yes …. and so, one of the things we’re fighting for is to have a regulatory structure where that the community banks are recognised, together with other areas of public policy and then financed by the government. RM: Yes, but the government has the idea that it wants community banks to be financially self sustaining but it’s difficult for community banks to be self sustaining. Because the banks propose to work in a small area and the amount of loans or currency that we will circulate in that area won’t be enough to cover the costs of running the bank. We only charge 1% interest on our loans! Conventional banks charge 18 or 20%. So we can’t sustain all of our wider activities that are connected to the loans. SH: Do you know how the micro credit system manage to survive in India? RM: I don’t know how they survive but I would guess its not the bank paying for itself rather it is public and private relationships. SH: So, there will alway be the need of third party support? RM: Its not that there will always be the need for support, we believe that access to credit has to be considered as a constitutional right, a human right, to be able to access it in a dignified way. Not in the way that it is now. And so the state has an obligation to do this. In the same way that we have the right to access health care, the state should also guarantee financial resources for the people to develop their communities. Sometimes the state tries to provide access to these resources but many of the people can’t access the resources in the conventional way, for example, they can’t prove their income. So, it’s a political battle too. With President Lula there was a lot of distribution of resources to the poorest with some social programs. The poorest receive benefits like ‘bolsa familia’ but these benefits are paid through conventional banks and initially there was a need to do it that way but now we’re trying to construct new ways to relate to communities and develop local economies. Brazil, is in a good economic phase but we’re importing more and more from China but not investing in strengthening our own local production base. Brazil is still a big farm we only export primary materials. For example, we extract oil but send it off to be converted into petrol and then buy back the petrol or we send our soya off and buy back our cattle feed. …..And so back to the methodology used by the banks, which was developed by the community itself. We use a method called “aval solidario” [or Solidarity Endorsement is the direct translation but probably best translated as Solidarity Lending]. So we don’t use the convention ways of checking if people have good credit history or if they have unpaid debts. We speak to their neighbours or local shop owners for references and we try to make the person understand the money we’re lending is the communities money and if they don’t repay their neighbour won’t have money when they need it and that the community will know that it is you that is owing the money. This is a good way of filtering as many people like the traditional way where nobody knows about your debts. But by the same token we also know why people aren’t able to pay and can support them. For example we know a typical example is someone earning a day by day wage and they borrow money to pay their gas bills and then they arrive saying I have money to pay you back but my son is ill and if I pay you I can’t pay for medicine. And so we go building this community relationship with people and identifying their potential. SH: How many loans do you have active at the moment? I don’t know of the top of my head but can show you. So, how does it work. People come here and ask for credit and we go to their house or work because we have two types of loans. The consumption loan that we provide in our currency and that is usually for basic things like gas or cloths etc. And then we have the productive loan, which is our key area because that’s the way that people will be able to make their own money and pay their own costs. But the consumption loan is one of our main ways of injecting our currency into the community but we also realise that this isn’t the best way as this is a type of loan that people most have problems paying back. Logically if they have problems paying to consume basic needs now, there’s nothing to guarantee that their situation will be better next week. So, when our credit analyst goes to the person’s house, they’re not just looking to see if the person can pay their financial responsibilities. its to identify any other areas of potential. For example, we might see a single mother with 5 small kids that can’t go out to work and we lend her some money but next week she’s still stuck. So we look for ways for her to make money, provide training with courses that help to make money from within her home. Many times we teach people how to access their social benefits. SH: What type of things could she do to make money from home? RM: Sewing, for example, artisan in general or perhaps looking after other children. Or maybe you find out she’s a good cake maker so you search out people that will buy here cakes. The bank is always trying to build this network. This is why we’ve identified that community banks can’t just be a financial organisation. There’s already a lot of those out there where the bank says he can’t pay the loan so ‘see ya’. Our concern here is not the money, our concerns are for the people. We need to find ways of strengthen the economy of that person, we don’t want to strengthen the economy of money, we want to help people make their own income and break free of the vicious cycle that they’re in. And so the objective of our currency is that. We want it to help make the economy circulate in our community and that people debate about the idea of money. People ask “What’s the alternative currency for?” and we ask “What is the Real [Brazilian National currency] for?” and “Why does money exist?” and so we create this debate so that people can see that capital creates money so that money is channelled towards a few dozen people. The tradition banks like our micro credit because they can’t do it anyway because of their bureaucracy but they don’t like the idea of our currency because our currency won’t circulate in their domain. SH: Do the banks feel threatened by the currency in any way? RM: They don’t feel threatened at this point because its at a very small level of activity but at the same time its not something that they support. I think i’ve spoken a lot, what questions do you have? SH: I spoke to a Brazilian economist and told him that community currencies were growing rapidly throughout Brazil and his first reaction was that this was crazy and dangerous and would create inflation. What would be your response? RM: I’m not an economist so can’t have the same level of vision but I don’t really believe in this. I believe that this is the fear of the capital, for me if there’s inflation and the R$ national currency starts to devalue but our currency still has value then for me that’s good. Because the regulation for this is to guarantee that our currencies are tied to the national currency so we don’t have much of a way to escape from this. Our currency could escape in that way if it wasn’t tied to the national currency and then it could create a parallel economy but its prohibited by law in Brazil, even though we have experiences with that kind of currency too. So, given the currency is tied to the national currency I don’t think that this argument carries much logic. SH: Most community currencies that I see in Brazil are in rural areas and I’m told that this is because these are areas with lots of surplus capacity and very little credit to help the economy function but now you’re doing it an urban area. What’s the differences? RM: I don’t know but I guess its more difficult in some ways because we have a community with a history of violence and so we have a community that has a lot less trust in its neighbours and less of a community relationship. In smaller communities everyone know’s each other. Another thing is that here we have a lot of options for things. Rural communities are more of a closed economy. The big difference for the bank is the type of people who are on the front line of your development work. But we’d been in this building for a few years and engaged the community in developing the currency and so the state guarantees the national currency but we guarantee our currency so people have to trust us because money is nothing more than a piece of paper. When we started the bank it was very funny. We’d lend people our money and we’d have to go with them to the shops because they were afraid to turn up with our money. But i think there’s a far greater distrust here than in the interior. But we went discovering the potential in our own community. That’s one of the possibilities with the currency. So you build the services of the bank within the demands that you have from the community. So, for example, we work very much in the area of culture. As you say there’s more than 100 community banks in Brazil and the only one with services directed around culture is ours. Because we identified this economy in our community. Once we went to Banco Palmas and we noticed that their clients are rural clients wanting to borrow money for chicks so they can produce an egg farm and for us that’s just not relevant. SH: How are you seeing the growth of the banks in Brazil past and future? Sometime in Brazil for us to change things like a law we need to first infringe that law and so we are very much in this phase of infringement. So the current politics puts us in a place that we’d rather not be, but we work with what we’ve got. For example, last year the network of banks entered into a partnership with the Mistry for Work where the objective is to open 100 more banks before the end of the year. The state gave us that demand and to finance our work we sometime have to get into these deals. Not that we don’t want to open 100 banks but when the targets are very inflexible sometimes you’ll end up opening banks in places that aren’t right. The community isn’t ready to look after a community bank. So I figure that if we don’t improve these policies we’ll end up with lots of banks opening and then closing. So we’re seeing that to have a more affective politics we’re seeing that the process is to open lots of banks and have lots of visibility so that the state recognises that there is a need to invest and build a better political structure for this. SH: Is there anything that you might need from people outside Brazil? RM: Anything from finance, which is the key, as I said we have banks in places like Rio’s Cidade De Deus favella (shanti town) that’s been going for a year but has no money to lend. This weakens the credibility of the bank from within the community. They’ll think its all talk and no action. Another thing is that here in Brazil we have lots of problems maintaining a network of community banks. For example, some of the banks are run by old ladies who don’t even have internet connection etc. SH: Yes I noticed. I tried to research the network and i noticed that most information is at least 2 years old. Who looks after this part of the network? RM: Initially it was the Banco Palmas but now there’s a larger collective that made the partnership with the government because the government never works directly with one bank it works with groups of banks. So I think we need to strengthen the local networks but also we need to strengthen the international networks of initiatives to show that there is an international movement of significance, which helps to strengthen our own political arguments. SH: Talking about international networks I hear a lot about things happening in Uruguay [Commercial Credit Circle] do you have any connection between Brazil and Uruguay? RM: No. We [UPM] don’t have a connection. We, like many others, have very little awareness of what’s happening in the rest of South America. We’re often more likely to know about what’s happening in Europe than what’s happening in South America. SH: In the UK community initiatives are not allowed to use the term ‘bank’ yet in Brazil you use it in your names, for example in Banco Palmas, and many of the other banks? We recognise that we are not banks because of the legal issues but also because our service is extremely different to the conventional banks but Banco Palmas started using it really as satire. Ceará [the Brazilian state where Banco Palmas is based] has lots of comedians and Joaquim [Banco Palmas founder] is a great comedian. Until now we’ve not had any problems using the name ‘bank’ in Brazil. We can’t do many of the services that a normal bank would do, in fact we can’t really lend the productive loan but we do, from the point of view of the state we can only work with the community currency. SH: Which are the organisations that are helping and supporting the growth of the banks? RM: It’s very connected to the older banks, which have more experience Banco Palmas is in the North East, Banco Bem in the Espirito Santo, which are two banks that support the creation of other banks and then there’s the universities that have been partnering. There’s Núcleo de Economia [Pernambuco and there’s Nesol < added by Shane] in Sao Paulo and there’s a university in Bahia, which I’m not sure of the name, but it has an incubator for the people’s cooperatives. In the South of the country there’s lots of cooperatives and revolving funds but not so much in the way of community banks. In the far north of the country there is an entity in Para, which i don’t remember the name of. 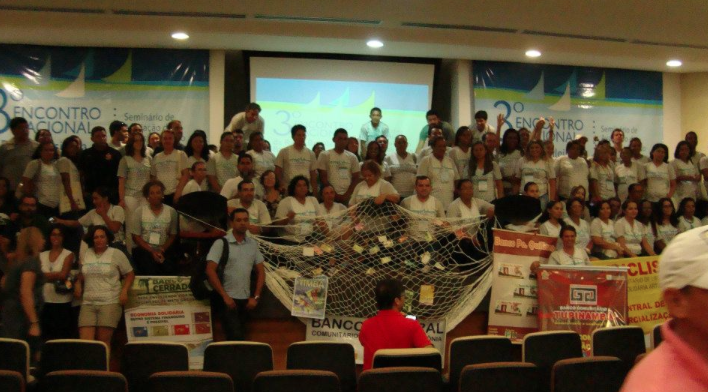 It’s these entities that have joined together to make this partnership and progress the community banking in Brazil. 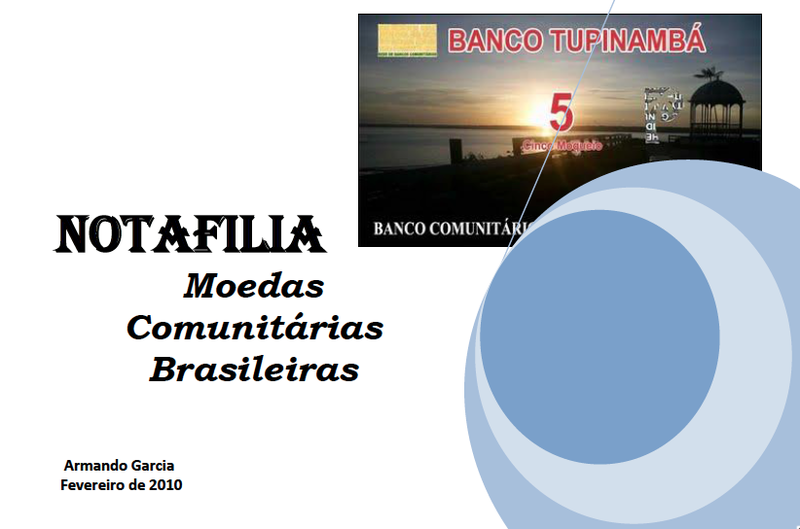 Thank you for yours kindly words about “Moedas Comunitárias Brasileiras”. I am working on it and I am amazed about how thinks develop in Brazil in those 4 years! It’s a BAZAR [like the turkish Gran Bazaar]. well spotted. i’m not very good at spelling and grammar etc.